Abstract expert opinion about the cultural value of Berlin gas lamps (in english). Klopstockstr. 2, 10557 Berlin - near S-Bhf station Tiergarten and the Gaslamp Museum! 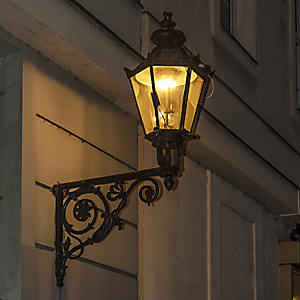 More than half of the gaslamps in the world are to be found in the streets of Berlin. Many areas of the city are completely illuminated by their golden yellow light. The Frohnau district alone is the largest consistently gas-lit area in the world. Gaslamps are silent witnesses to the eventful history of Berlin. They have survived good times and bad times unharmed. That is perhaps why they are an integral part of the city's identity. They have become an unofficial landmark of the city because they are unique in the world. 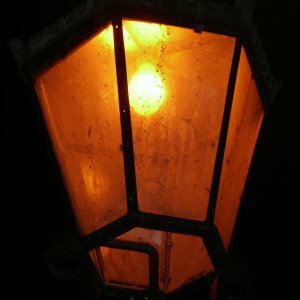 There are 44,000 gaslamps left today. 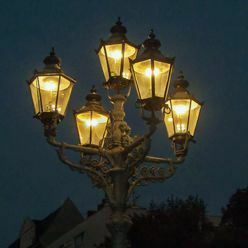 Real Berliners call them "their" gaslamps because their personal memories are often attached to them. Our section entitled Gaslamps describes the various different types of gaslamps to be found in the streets of Berlin. The dismantling of Berlin's unique streetlighting - the largest system of its kind in the world - started in Fischerhüttenstraße in Berlin in the summer of 2008. 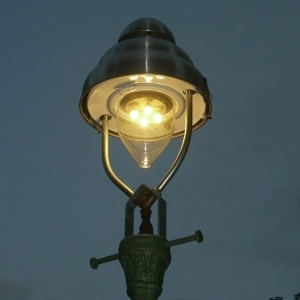 8,400 gaslamps of a certain type are to be replaced by electric lighting by 2014. For further details, please go to the section entitled News. After that, the Berlin Senate plans to remove all of the other gaslamps from the cityscape. In the past, all parts of the political spectrum were in agreement that Berlin's gas streetlighting was to be preserved. In the early nineties, the Berlin parliament, assisted by Gaslicht-Kultur (former Gaslichtinitiative Berlin), passed an act guaranteeing the preservation of all gaslamps. 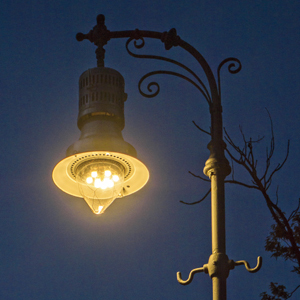 However, since the maintenance of Berlin's streetlighting passed into private hands, the investors are calling for gas lighting to be completely replaced by electric lighting. They do not care about the appearance of the city or about cultural or historical matters - all they want to do is make the highest possible profit from Berlin's streetlighting. Gaslicht-Kultur e.V. lobbies on a political and social level to prevent this disastrous destruction of Berlin's nocturnal cityscape. There is no doubt whatsoever that Berlin's gas lighting is unique in the world and worthy of protection. However, laws for conserving landmarks of historical importance usually only apply to buildings and to large-scale ensembles of streetlamps. Also, the laws only protect the individual forms of the lamps but not the technology itself that creates the light. A gaslamp and an electric lamp with the cold light it emits are seen as equivalent by the law as long as their form is identical. We want gaslamps with their unmistakable light to be designated as a part of our cultural and historical heritage. Berlin's gas streetlighting must not be seen in terms of costs and expenses alone. This would not do justice to its true value. We are working to bring lighting planners and those with political responsibility in Berlin to come round to our way of thinking about gaslamps. However, we can only succeed if we have a broad social and political consensus. If you want to support us in any way, have stimulating ideas or criticism or just want to have some further information on this subject, please go to the contact section. You You may well be wondering what a picture of a poorly maintained lamp is doing on our homepage - especially since it is an electric streetlamp. Unfortunately, shabby electric lamps are not uncommon because they degenerate a lot faster than gaslamps do. For example, this picture shows how dirty they can become as a result of dead insects. Thousands of them are lured towards electric lamps every night, where they are burned. Electric lamps are real insect killers, and this in turn is a serious threat to animals like birds, which feed on insects. In contrast, the light emitted by gaslamps contains no ultraviolet light, so insects do not perceive it. Also, the reproduction of colours by gaslight is unmatched. The electric sodium vapour lamp you see here reproduces only about 65 percent of the original colours, whereas gaslight reproduces 100 percent of them! In other words, gaslamps reproduce colours as authentically as natural daylight does. For some more arguments in favour of gaslight, please go to our section entitled facts and figures.